We believe that everyone is able to practice yoga. That’s because yoga isn’t just about the asanasa (postures). It’s about pranayama (controlling the breath). It’s about discovering ourselves on the mat through meditation. It’s about finding equanimity in our daily lives. With our smaller classes, our teachers get to know you and are able to give you more personalized attention and help. And props are always available to assist students into postures so they can receive the full benefit of each one. Our classes reflect the personalities, special interests and non-yoga education of our teachers and the passion we have for this practice of health and wholeness. You’ll find classes that range from gentle to more vigorous, vinyasa classes that flow with the breath and yin classes that take you deeper into a stretch. Monthly restorative and yoga nidra, along with special classes such as karma donation classes and workshops round out our schedule. New to our studio? We ask that you arrive 10 minutes early so you can fill out a waiver. New to yoga? Wear loose-fitting comfortable clothes and don’t eat at least one hour before class. 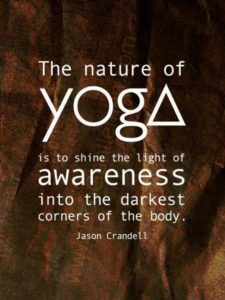 Feel free to call Danette for information on any of our classes or about yoga in general: 618-467-8827.